Bulgogi and Bulgogi recipe. Bulgogi is marinated meat dish with Korean red chili paste. Anyone can make bulgogi with this easy bulgogi recipe. 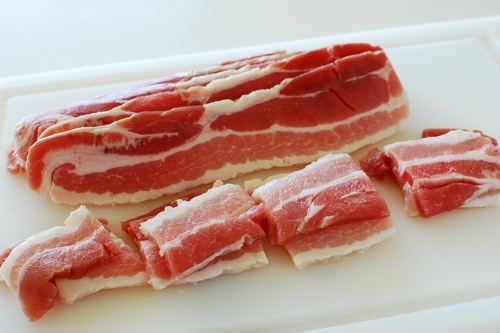 Cut the pork belly into bite size pieces (about 2-inch long). Combine the meat, onion, and scallions with the marinade and mix well. Marinate for at least an hour. Heat a grill pan or a skillet over medium high heat and add the pork slices. Cook until the pork is cooked through and slightly caramelized, turning over once. *Note: The quality and taste of commercially available gochujang (고추장) varies, depending on brands. Some of the major brand names available in the U.S. are Chungjungwon (청정원), Haechandeul (해찬들), and Sampio (샘표). Each brand makes different types of gochujang, depending on the types or origin of ingredients used. Chungjungwon (청정원) is known for its Sunchang (순창) gochujang. Sunchang (순창) is a town that’s famous for making the best gochujang. Some brands note the level of spice on the package, e.g., no. 3 is medium hot and no. 4 is very hot. Bulgogi recipe. Bulgogi is marinated meat dish with Korean red chili paste. Anyone can make bulgogi with this easy bulgogi recipe! I stumbled upon Eating and Living, a Korean food blog by Hyosun earlier this year. I was so delighted that I spent hours reading through Eating and Living, learning authentic Korean home cooking that Hyosun has been making for her family. When it comes to learning authentic Asian cooking, nothing beats learning from a native home cook who prepares the food for the family on the daily basis. Eating and Living is a wonderful food blog about Hyosun’s love for Korean recipes, complete with step-by-step photos and vibrant food photography. Let’s learn how to make Bulgogi! Hi! I’m Hyosun from eating and living, the Korean home cooking blog. I was so excited and flattered when I received an e-mail from Bee inviting me to guest post on her blog. It really is an honor to have the opportunity to guest post on this amazing blog. Bee asked if I could share a bulgogi recipe that uses gochujang, which is Korean red chili pepper paste. So I decided to show you how to make dwaeji bulgogi (aka jeyuk bokkeum) using pork belly (samgyupsal). You can also use pork shoulder or loin or chicken for this recipe. Bulgogi is a marinated meat dish made with thin slices of beef, usually rib eye. It is no doubt one of the most well-known Korean dishes outside of Korea. When it’s made with pork, it’s called dwaeji (pork) bulgogi. 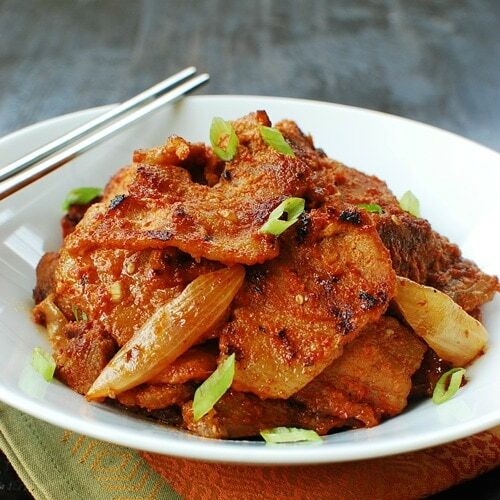 Unlike its beef counterpart, which is traditionally marinated in a soy sauce based sauce, pork is typically marinated in a spicy gochujang sauce. 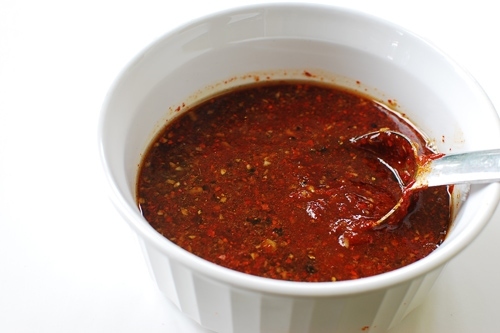 Gochujang is a fermented red chili pepper paste made primarily with gochugaru (Korean red chili pepper flakes), glutinous rice powder and fermented soybean powder. It’s pungent, spicy, slightly sweet and salty. 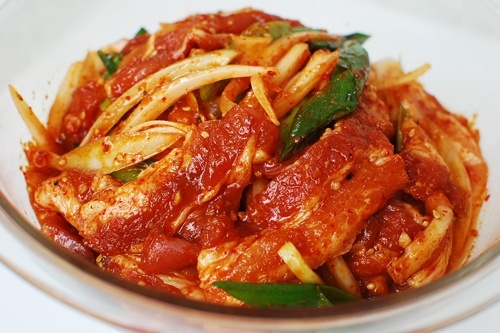 For an authentic Korean dish, there is simply no substitute for gochujang. Gochujang can be found in any Korean market. The marinated pork can be either grilled or pan-fried. The best way to enjoy it is to wrap a bite-size piece in lettuce or a perilla leaf and eat the whole wrap. 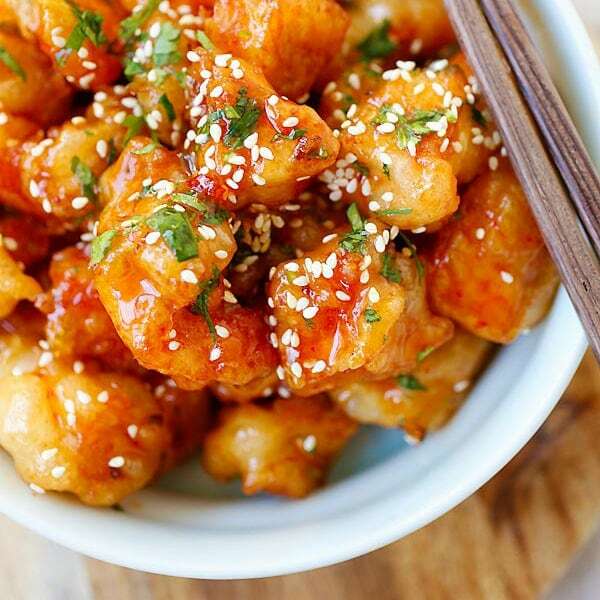 If you love fatty pork and spicy food, this is the perfect dish for you! *Note: The quality and taste of commercially available gochujang (고추장) varies, depending on brands. Some of the major brand names available in the U.S. are Chungjungwon (청정원), Haechandeul (해찬들), and Sampio (샘표). Each brand makes different types of gochujang, depending on the types or origin of ingredients used. Chungjungwon (청정원) is known for its Sunchang (순창) gochujang. Sunchang (순창) is a town that's famous for making the best gochujang. Some brands note the level of spice on the package, e.g., no. 3 is medium hot and no. 4 is very hot. I love Korean food. Thanks for sharing the bulgogi recipe… thanks Bee for introducing us to a great Korean food blog. You’re right, it’s the best to learn from the native home cooks. Never had it looks yum! Just say the words pork belly and I’m there! This looks especially amazing. I love bulgogi, but if this recipe is even half as good as it looks, it’s going to blow other bulgogi recipes I’ve tried out of the water! I love Korean food . Thanks . Best bulgogi I’ve seen! And gochujang is fantastic! Yummmssss…. 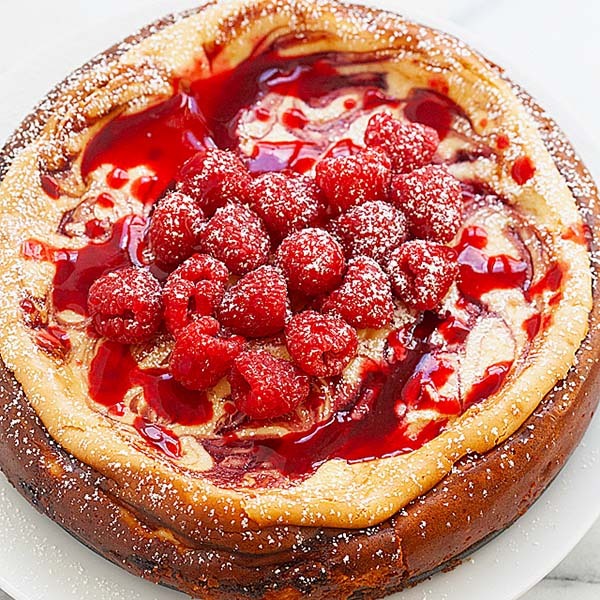 Oh gosh, this looks so yummy! Bulgogi is definitely one of my top favorite dishes in the whole wide world! Thank you, Bee, for letting me guest post! Mmmhh, that Bulgogi looks amazing! A dish I love. Hi Bee. You DO have an amazing site. First off, I love gochujang, I love bulgogi and I love Hyosun and Eatingandliving! I’m so glad you featured this amazing blogger and cook. What a coincidence! I plan on featuring her on my blog this week too! And side note, but congrats on your cookbook! I’m enjoying Hyoson’s blog very much and will try this Bulgogi recipe soon! Bee! I am drooling here! 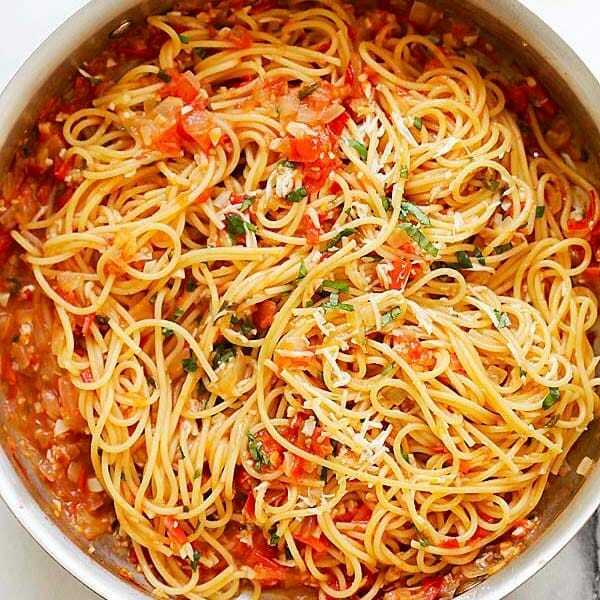 Wow, I am so glad to find this recipe!! I have been looking for spicy bulgogi recipe for a long time because it’s my husband’s all time favourite Korean dish. Thanks for sharing this, Hyoson :)!! Oh my, Bulgogi is a family favorite! 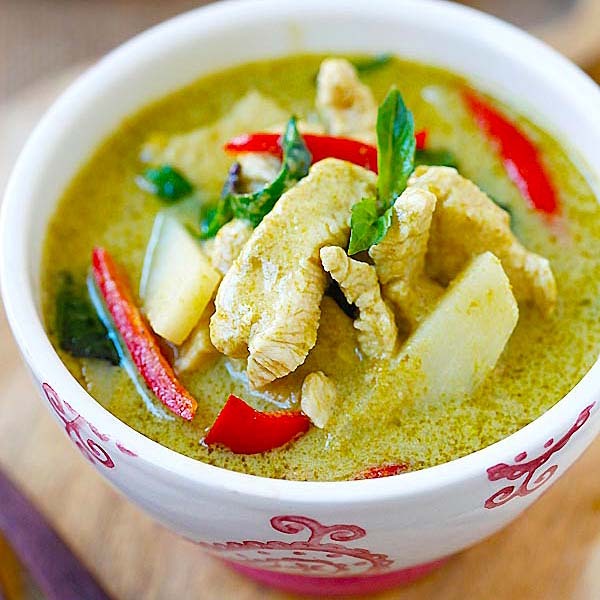 We love Asian food at home, and I get so excited when I come across a new recipe. Must try this one. Thanks for sharing, Bee ! Congratulations on the new cookbook! I am so happy I found this. It’s one of my favorite Korean dishes!!! Looks so good! Has anyone tried this marinade with chicken? Thanks Rasa Malaysia for another great recipie! Thanks for sharing Hyosun’s blog with us. Korean food is so delicious – I love bulgogi and bi bim bap. My two favorites!! This is something I want to try now. I’m not so keen on pork belly though so I think I’ll research the beef one. I love love bulgogi. I normally use the already made mix instead of making it at home. I just used this as a sauce for pulled pork. Wow. It’s really tasty. hi, may i know where you buy your gochujang in Penang? thanks! I am based in t he US. I think you can get it at places like Carrefour or Cold Storage. Do we need to put some oil before frying the pork? HI Adeline, There is quite a bit of oil in the marinade as well as fat in the pork, more oil should not be necessary. Hello – I’m wondering if anyone’s in Penang. I cannot find gochukaru anywhere. Is there any particular grocery store that sells gochukaru?